Fall is quickly approaching, and in less than two weeks my daughter will be 12 months! Time is going by quickly, but so much has happened since her birth that I feel like there has never been a time where she wasn’t part of my life. My mind, body, and spirit balance is finally coming into place, and I’m feeling more like myself every day. Moderate exercise a few times per week, eating organic veggies daily, breastfeeding, connecting with other parents, and feeding my spiritual needs are all tools that are helping me be focused, happy, and present. So much has happened since my last blog post! One of the biggest things that has happened in my life, aside from my baptism with Audrey--which was really awesome--is that I have started a new role in addition to being a doula. 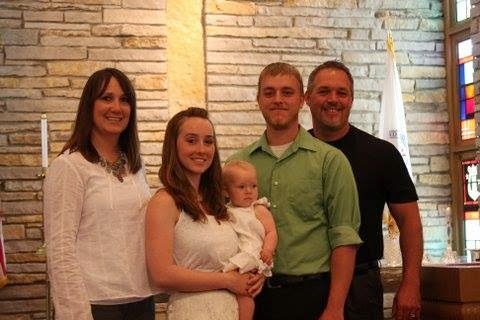 I am now the Christian Educator for a church in the United Church of Christ. I coordinate the Sunday School and other youth programs within the church, and I’m having a blast planning meaningful experiences for the little ones. Between my family, doula work, and fulfilling career I feel complete; yet sometimes I also feel overwhelmed and exhausted. That’s okay because I know that I’m doing the best that I can. I understand that with great responsibility comes great stress and sometimes consequences. I believe that I am on a mission to make a difference in the world by making a difference within the small communities I am dedicated to. My community is a part of this world, and change has to start somewhere before it spreads. I’m feeding the spiritual needs of children by introducing them to Jesus’ teachings. I’m sharing my views of compassion and forgiveness with the next generation. I’m advocating for better birthing practices for women. I’m coordinating positive experiences for teens that they will remember for the rest of their lives. Just for fun, I would like to share two events from last week that happened with an hour apart from each other. I’ll share the second story first. While making my morning batch of coffee, I heard my cat, Duchess, running around the kitchen. I turned around, and I wasn’t sure of what I saw at first. She was holding something large in her her mouth, and it was dragging on the floor. This was a funny sight! Proudly, my little Duchess threw the thing at me, and it landed right next to my feet. She pranced around, purring, showing me her trophy. It was a chipmunk, and it was very much dead. 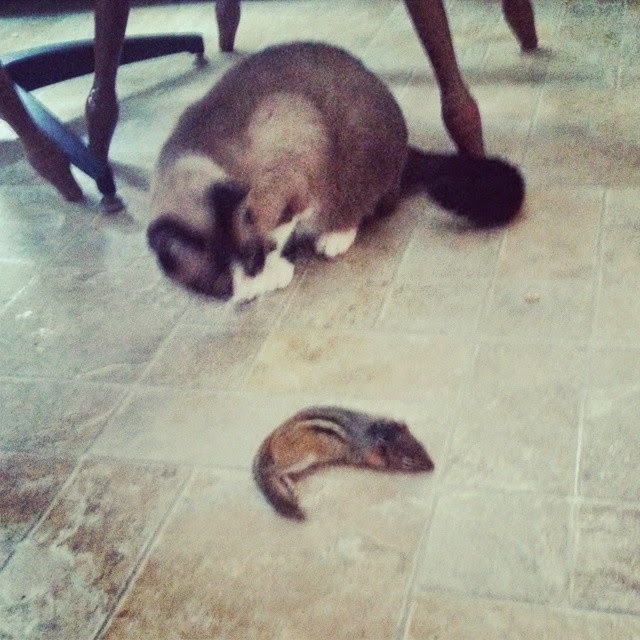 My indoor cat caught a chipmunk! It was crazy. I went to grab some tongs to pick it up, but she threw it against the door, and blood somehow streaked on to the kitchen floor. I couldn't be mad, though. I was used to cleaning up Duchess’ messes by that time. Earlier that morning I was reading on the couch, and I heard Duchess making a weird sound. I looked at her just in time to watch her projectile vomit all over the entertainment center and on to our white carpet. Awesome. I ran into the other room to grab some carpet cleaner and towels, leaving Audrey to continue playing with her dollhouse. From the other room I heard my daughter coughing. Afraid she was choking on something, I ran into the living room, and what I saw is a sight I will never forget. My petite blonde daughter was covered it cat vomit. She had two fists full of vomit, and--you guessed it--there was cat vomit all around her mouth. As gross as that was, I had to find humor in the situation. If we’re unable to find the humor in daily setbacks, then we won’t survive. Life will never be picture-perfect, and that’s okay. This is as close to perfect as it gets. Parenthood isn't easy, but the reward is great.